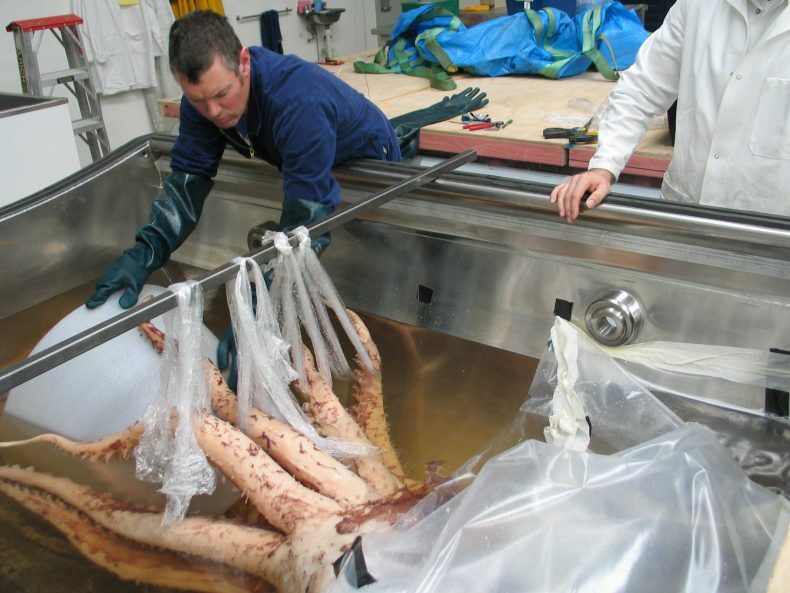 Work is underway preparing the mounting system for the colossal squid in its display tank. Unless the squid is supported by acrylic mounts it will remain a collapsed heap on the bottom of the tank – not very appealling! To display it in as realistic pose as possible a series of supports will be manufactured to splay the tentacles out so the beak can be seen, and to expand the mantle from its collapsed position. The squid will be slightly angled to one side in the tank, so it will be possible to see the eye and even the funnel, which is on the under side of the mantle. lighting inside the tank will illuminate the specimen from the sides – eliminating any glare or reflection from the surface of the preservative. 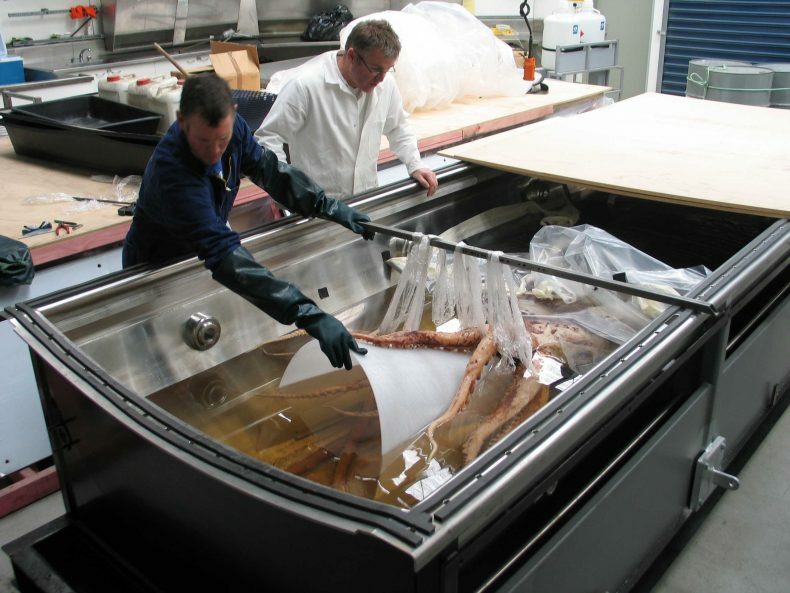 Te Papa conservators Mark Kent and Robert Clendon have to work with the specimen partially supported by the liquid preservative. The arms are held in the desired position using plastic food wrap while they prepare the template. The template will then be used to cut the final acrylic mount. Once the templates are completed and the mounts made, the specimen will be moved to the museum building at Cable Street and mounted properly, before the lid is placed on the tank it is filled with the preservative solution. Museum conservators and mount makers have to deal with objects ranging from artefacts to fine art sculptures. The colossal squid is a new challenge! The fluid has discoloured slightly (but not as much as we thought it would)- we think some pigment has leached from the skin. Some of the “discoloration” you see in the image is just the reflection of the colour in the room – if you look closely at the submerged arms it is much clearer. All of the fluid will be drained before the specimen is moved during the gallery refurbishment next month, and replaced with a fresh solution for the opening in December. Nice job boys. The fluid looks a bit yellow to me, is there a plan to replace it?